Have you heard the news? I am so excited to share a new, totally free set of resources from Apple Education. Today Apple Education released four books of lesson ideas and one teacher guide to spotlight the ways Everyone Can Create. At a special event held earlier this year, Apple Education announced a new initiative called Everyone Can Create. In addition to promoting the power of creation in the classroom, they’ve designed a powerful set of resources for educators. And they are completely free! In my book, Tasks Before Apps: Designing Rigorous Learning in a Tech-Rich Classroom, I discuss the importance of empowering students as creators. 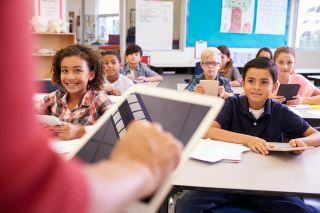 I love how this new free resource from Apple Education focuses on the task – the why behind the use of digital tools in the classroom. When you combine the powerful creation tools from Apple with thoughtful task development, students can do amazing things! The Everyone Can Create resources are a series of iBooks from Apple Education. You can download them all for free and take a look at the activities, student work examples, and assessment items. This link will take you straight to iBooks which you can access from a Mac or iOS device. There are four Everyone Can Create books and one teacher guide. This set of resources includes a book on Drawing, Photo, Music, and Video. I am going to take a deeper dive into each one with you in the next few weeks. Check back on the blog or sign up for my weekly newsletter to make sure you catch the profiles of each book. All five of the new books, including the teacher guide, are now available to download. This landing page will take you to an overview of all of the new books. When I first took a peek at these iBooks, I was super impressed. Especially at the range of subject areas included in each resource. As a professional development facilitator, I travel to lots of schools and work with teachers in all content areas — from kindergarten to high school. One thing I often hear from educators is a request for how to bring creative activities into every subject area. These iBooks have you covered! You’ll find activity ideas for math, science, social studies, English Language Arts, and more. It’s a robust collection ready for you to dive into right away. In 2013 I became an Apple Distinguished Educator – an experience that completely changed the trajectory of my life. I reached out to my network of fellow ADEs to find out how they felt about the new resources from Everyone Can Create. It was no surprise that they are just as excited as I am about what these resources mean for students and teachers around the world. I think the most important thing to remember about creativity is that it doesn’t exist purely for its own sake. I mean it can – you can throw a gallon of orange paint against the wall and call it creative – but that’s when people question its purpose. Rather, I think creativity’s role is to help solve problems, improve life, or meet a need. Problem-solving doesn’t have to be this rigid, sterile process. Good solutions – in order to really resonate – usually require a great deal of creativity to formulate. With this in mind, this is why I love the Everyone Can Create iBooks that Apple has produced. They promote creativity of all types, but in such a way that it is applicable and modifiable to a wide range of classrooms and curricular disciplines. The problems are still there to solve – but with Apple’s tools and ECC, we can now construct and communicate solutions which are not only creative but also compelling. I am thrilled to see this deep dive that integrates creativity into content learning. As teachers, we want to reach all students, and the inclusion of drawing, music, photo, and video into the traditional academic content areas is a recipe for that success. The Everyone Can Create Teacher Guide sparks a lot of ideas! We broaden our students’ perspectives and experiences by helping them to communicate and reflect on their learning through the creative arts. Apple makes the most engaging and useful educational tools for students and educators. Now with the Everyone Can Create Curriculum, with five books, including Everyone Can Create: 1) Photos, 2) Video, 3) Music, 4) Drawing, and 5) an awesome Teacher’s Guide, educators have the skill-building lessons, examples, and steps they need to help everyone learn. I love how the Apple Pencil is used in these lessons. As an educator and a parent, I know the best learning is when students are creating. We should be using our devices to create far more than they are used for consumption. Whether you’re talking Depth of Knowledge 4, Rigor and Relevance, synthesizing learning, or SAMR, what you are really talking about is creating. Even better it’s fun! Get started with the new Everyone Can Create resources by heading over to this special landing page. I can’t wait to hear what you think! Dr. Monica Burns is a former classroom teacher, Speaker, and Curriculum & EdTech Consultant. She is the author of Tasks Before Apps (ASCD) and #FormativeTech (Corwin). Visit Monica's site ClassTechTips.com for more ideas on how to become a tech-savvy teacher.